Dr. Melicia Whitt-Glover is President and CEO of Gramercy Research Group in Winston Salem, NC. Gramercy Research Group’s mission is to positively impact and improve the lives of individuals and communities by addressing health and related issues. She is also Executive Director for the Center of Excellence for the Elimination of Health Disparities (CEEHD) at Winston-Salem State University. CEEHD strives to promote equity and social justice in health care delivery, treatment, and outcomes by leading collaborative efforts to generate and disseminate evidence-based, policy-relevant solutions, and to educate future leaders how deliberately consider and incorporate equity and social justice in professional practice. 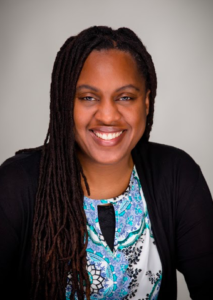 For over 20 years, Dr. Whitt-Glover has been engaged in research and evaluation projects designed to identify effective strategies to promote adherence to national recommendations for physical activity, diet, and healthy weight gain to address disparities in chronic disease morbidity and mortality. Her research has been funded by the National Institutes of Health, the Patient Centered Outcomes Research Institute, national and local foundations, and local government organizations. She is a member of the 2018 Physical Activity Guidelines Advisory Committee, which is a group of the country’s most accomplished physical activity and health expertise who will play a critical role in a comprehensive process, culminating with the publication of the second edition of the Physical Activity Guidelines for Americans. Dr. Whitt-Glover received her BA (Exercise Physiology, 1993) and MA (Exercise Physiology, 1996) from the University of North Carolina at Chapel Hill. She received her Ph.D. (Epidemiology, 1999) from the University of South Carolina. Dr. Whitt-Glover completed a postdoctoral fellowship at the University of Pennsylvania School of Medicine (2000 – 2002).